Washington’s Noah Dickerson, Washington State’s Robert Franks and Seattle U.’s Aaron Menzies are early entries in ther NBA draft. Teammate Noah Dickerson has also declared, but reportedly is not hiring an agent, meaning he can retain eligibility for his senior season if he withdraws from the early entry list by May 30, per NCAA rules. The early entry field includes 55 international players. The two-round draft has 60 slots. Two other state players, Washington State’s 6-7 junior forward forward, Robert Franks Jr., and Seattle University’s 7-3 junior center, Aaron Menzies, also declared. The 6-5 Thybulle has started every game (99) in his three UW seasons and set a school single season record with 101 steals. He also led the Huskies with 49 blocks. 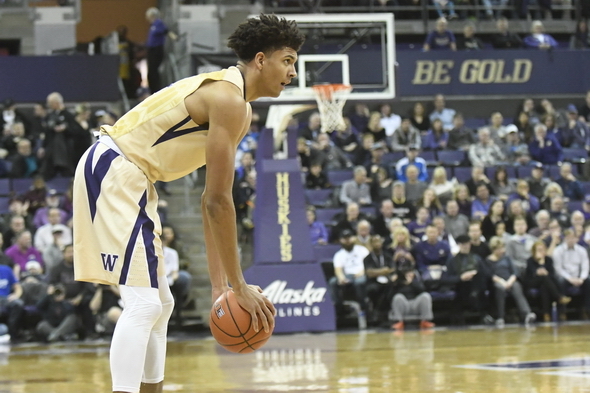 Thybulle and Dickerson helped Washington to a 21-13 record, the most wins since 2011-12, and made the National Invitation Tournament field, narrowly missing the NCAA tourney after a six-year absence. If Dickerson returns, Washington will have five starters and eight of its top nine scorers returning, plus two top recruits ranked in the the top 100 by ESPN. So approximately 3/4ths of underclassman declaring for the draft aren’t getting drafted , and that’s assuming that every single pick is an underclassman , which of course is ridiculous . It amazes me how many of these youngsters see dollar signs in their eyes and forego their college careers . And only first round picks get guaranteed contracts . Someone is giving these kids some seriously bad advice ..
Thybulle is smart to return ; he’s considered 2nd round talent at best NEXT year , and he’s playing for an ascending college team with hopes of making some noise in the dance this season . Being a huge Husky basketball fan , it’s easy for me to be a homer and want him back , but truthfully he probably had about a 10% chance of being drafted this year , and would’ve wound up on someone’s development D-team . Welcome back Matisse – GO DAWGS ! Of course, everyone said the same thing to Isaiah Thomas, But his success unfortunately perpetuates the belief that anyone can do it. Dickerson should decide to stay. I doubt that he’ll even get drafted this year. He could stay, earn his degree, and be a part of a possible conference championship….and finally go to the NCAA tournament. Finally, his draft status would undoubtedly improve with another season of great coaching and increased exposure on a good team. That’s what every undergrad is told, and 95 percent ignore the advice. There’s only 60 draft spots for the entire senior class and the 235 undergrads/internationals.